Learn how to build a simple Siri Shortcut that will choose an item from a Reminders list and speak that item aloud. In this example, the Shortcut will get a random item from a list of chores. Closed captioning for this video is available on YouTube: Siri Shortcuts: Random Reminders. Let's take a look at building another Siri Shortcut in the Shortcuts app. This time we're going to use a Reminders List. Reminders is a great app that allows you not just to have reminders but you can have To Do Lists, Idea Lists, all sorts of things. So here I've got a Reminders list called Weekend Chores. It has a bunch of things in it that I should get done every weekend. 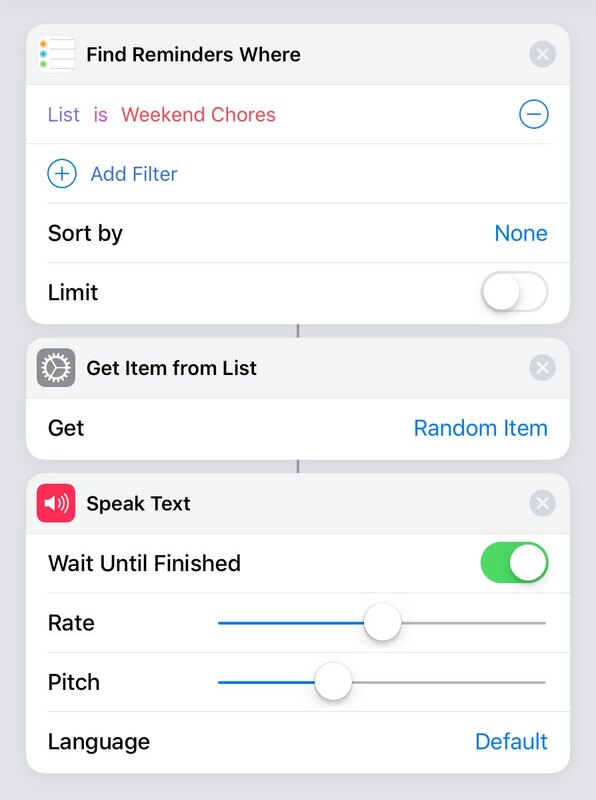 Now you can easily add items to this with Siri by asking Siri to, you know, add buy milk to my weekend chores list and you would get it added there. You can go in and edit it really easily. I can edit it on my Mac thanks to iCloud and everything. But now I want to be able to ask Siri to give me a random chore to do. So there are some hooks in Shortcuts to get to these items in the Reminders Lists. So let's take a look at that. If you don't have the Shortcuts App of course get it from the Mac App Store. It's the Shortcuts App from Apple and we're going to create a new shortcut. Now we're going to go and look for things that have to do with reminders. So I'll do a Search. We're going to get a bunch of things that are from the Reminders app. Suggestions. That's not really what we want. What we want is this stuff here that's under the Calendar category. There's one called Find Reminders. That's what we want there. Notice there's some other useful things there as well like the Get Upcoming Reminders and all and you can build shortcuts off of that. Find Reminders is pretty powerful. You can add filters here. So I'm going to add a filter and I'm going to say The List Is, and instead of reminders I'm going to say Weekend Chores. There's all sorts of things. Instead of List I can tap on it here and say Due Date, Priority, Title, all sorts of things. I can add more filters. As many as I want. So you can really customize this. Just pick reminders that you want. You can have it pick reminders for things that have due dates that you haven't yet done and have it give you a random one of those. Now how do I get a random one of these because if I run this now it's going to actually show me the results here. I'm going to get this list of results with everything in order. So clean dishes is first. Next is do laundry. But, I can change the Sort By to Random. That's really nice because now it will put them in a random order. So whatever is first is going to be a random item from that list. Now I want to do something more with this. I don't want to just have this list here in the Shortcuts app. I want to actually have Siri tell me what chore I should be doing. So I'm going to lookup things here and under List, because this is a list that's being returned, I can get an item from the list. So I'm going to drag that over as the next step. You can pick first item, last item, random item, etc. So I can actually pick the first item from this random list of weekend chores or I can change the Sort By to nothing, right, no sorting there and then say get a random item from this list. Either way I'm going to get a random item from that Reminders List of Weekend Chores. Now what do I want it to do. Well, it would be nice if Siri could speak it to me. So I'm going to put Speak Text there at the bottom. Now when I run it, it will speak one of those items randomly. Mop the kitchen. Now I can create this as a Siri shortcut by hitting the Settings there. Let's first name it something. So let's name it Weekend Chore. Hit Done and let's give it a better icon there. Something with a GIF that's something chore-like. There's a hand there. Done. Let's add to Siri. So I'm going to Add to Siri. Give me a weekend chore. I'll hit Done. Now I've got that. I'll hit Done here. There it is Saved. I could have added that as an icon instead. Something I can tap on my iPhone or iPad. But I did it for Siri. So let's get Siri to do it. Give me a weekend chore. Your shortcut says Go shopping. So there you go. That's kind of handy and my example is for chores but you can do a lot of other things with this as well by just changing some of those parameters there. What are those two small oblongs immediately below the ‘done’ button on the screen of the video you have just posted? One has a blue dot on white background and the other has a white dot on a blue background. William: Try pressing it and you’ll see. It is simply the “settings” button for the Shortcut. I actually press it at 3:29 in the video. Rocky: Reports are that this was limited for some people with the last minor update too iOS. But others say it is still there. So perhaps it depends on some things, or will take some time to roll out.